The choice of the allocation of public resources more and more scarce use is the current scenario of policy in Italy and, generally speaking, in most of the advanced countries. The decision of how to identify priorities represents a high point of what can be called "choice" as an ethical point of view. With regard to the specific allocation of resources in the health field, in Italy the criteria which are invoked are quite general and refer to those established by Law 662/96. Indeed, from these criteria, very different political strategies can derive. A similar puzzle can be frequently found in several European countries. Then, today many studies aim at establishing empirical indicators, which can help the political choice in the health field. Among them, indicators regarding the relation between socioeconomic status and health can be considered relevant. Indeed they would make it possible to provide not only specific health interventions in the strict sense, but also social and infrastructural policies focused on some of the causes of increased morbidity or mortality. 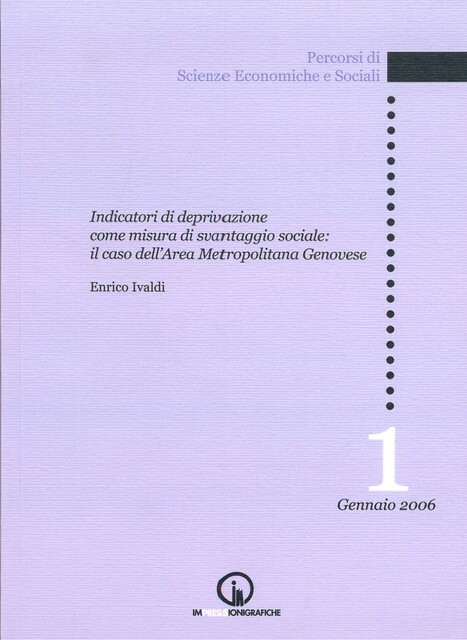 The present book has the dual purpose of proposing an indicator specifically for the metropolitan reality of Genoa, and discussing at the same time the information potential of these indices and their applicability in different contexts.